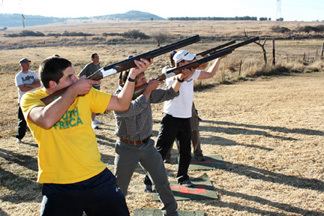 Laser Clay Pigeon Shooting, also known as Laser Clay Shooting or even Laser Shooting is a variation on the traditional sport of Clay Pigeon Shooting. Real shotguns are disabled and fitted with harmless infra-red laser equipment that can detect hits on specially modified reflective clays. A total of five people can shoot at the same clay at the same time. No risks! No injuries! No blue shoulders!